Learning how to make chandelier earrings is very exciting, as they are among the prettiest and most special earring styles that you can create. 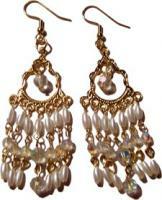 To make chandelier earrings, you use some kind of metal chandelier finding to attach to the earring hook. This chandelier finding allows you to have multiple drops, and spaces them out for you. The effect of having these many drops falling down from the metal finding looks like a real chandelier, and that's how they get their name! Chandelier earrings move well when you turn your head, because each drop uses eye-pins that allows a graceful movement within each drop. For a traditional look, use pearls and crystal beads, or for a funky look use brightly colored plastic beads. These instructions show you how to make chandelier earrings with pearls and crystals, as this really enhances the sparkling potential of each drop. By buying eye-pins and head-pins of the smallest size, you shouldn't need to cut off any excess. The entire post of metal that sticks out of the bead will be needed to make each loop. They will be the right size for every drop made in this project. Take an oval pearl bead, and slide it onto an eye-pin. Place the pliers immediately above the bead, and bend the wire of the eye-pin above the bead at a 90 degree angle to the rest of the pole. Re-position the pliers at the end of the eye-pin, and roll back to create an open loop. Hook the open loop through the first hole on the chandelier finding, and close it with the pliers. Repeat steps 1-4 for each of the seven holes along the chandelier finding, still using the oval pearl bead for each drop. Take a medium crystal bead, and slide it onto an eye-pin. Make a loop using the method in steps 2-3, and hook this onto the middle hole of the chandelier finding. Take a small crystal bead, and slide it onto an eye-pin. Make a loop using the method in steps 2-3, and hook this onto the first hole of the chandelier finding beneath the oval pearl bead already on the drop. Repeat steps 8-9 for every drop across the chandelier finding except the middle one - this should have the medium crystal bead on it already. Take another medium crystal bead and put it onto a head-pin. Make a loop using the method in steps 2-3, and hook this onto the middle drop of the chandelier finding, below the other medium crystal bead you have on that drop. Take an oval pearl bead, and place it on a head-pin. Make a loop using the method in steps 2-3, and hook this onto the first drop of the chandelier finding beneath the two beads you have on this drop already. Repeat steps 13-14 for every drop across the chandelier finding except the middle one - this should have a medium crystal bead on it already. Open a jump-ring, and hook it into the drop that is in the apex of the chandelier finding. Take a medium crystal bead and put it on a head-pin. Make a loop using the method in steps 2-3, and hook this onto the jump-ring in the apex of the chandelier finding. Open another jump-ring, and connect it to the loop on top of the chandelier finding. Keep the jump-ring open while you thread on an earring hook, and close the jump-ring. Make sure that the chandelier finding is facing the right way on the earring hook. The first earring is complete. Repeat steps 1-20 to make the other earring in the pair. It can be quite fiddly and repetitive to make chandelier earrings, but the end result is worth it. 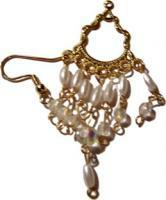 Add eye-pins with other pearls and crystals to each drop for longer chandelier earrings. These chandelier earrings are guaranteed to make you feel like royalty - why not make chandelier earrings to find out! query: INSERT INTO accesslog (title, path, url, hostname, uid, timestamp) values('How to Make Chandelier Earrings', 'node/56', '', '3.84.182.112', 0, 1555952517) in /home/surelion/public_html/drupal-4.6/includes/database.mysql.inc on line 66.